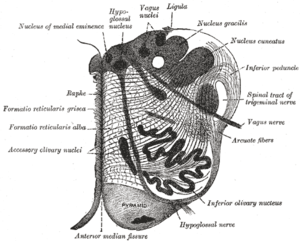 The dorsal respiratory group (DRG) is located in the dorsomedial region of the medulla, and is composed of cells in the solitary tract nucleus. The DRG is one of two known respiratory neuron localizations, with the other being the ventral respiratory group. The DRG is found in many types of fish and mammals. The DRG is involved in the generation of respiratory rhythm, and is primarily responsible for the generation of inspiration. It is stimulated via the apneustic centre in the lower pons and is also a part of the solitary tract, which is responsible for appropriating responses to sensory information from chemoreceptors and mechanoreceptors in humans. It is inhibited by the Pneumotaxic centre. ↑ Kolesnikova, EE (2011). "Role of glutamate and GABA in mechanisms underlying respiratory control". Neurophysiology. Bogomolets Institute of Physiology, Kiev, Ukraine. 42 (4): 294–304. doi:10.1007/s11062-011-9162-z. Berne, Robert M.; Levy, Matthew N.; Koeppen, Bruce M.; Stanton, Bruce A. (2004). Physiology, 5th edition. St. Louis, MO: Elsevier. p. 513. ISBN 0-323-03390-3.